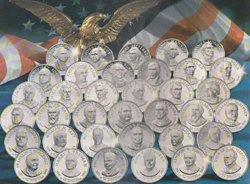 The History of Mankind Medals Collection (Franklin Mint, 1974) Current Market Value. Sell franklin mint silver fast! The most important events in the history of civilization were commemorated in this series of 100 medals. This was the first definitive medallic history of mankind. The events to be honored were selected with the assistance of a panel of internationally distinguished historians. The set was issued from 1974-1982. Each medal is a 51 millimeter Proof, 24K gold electroplate coating on sterling silver. Get a free, no obligation bid by completing this form. Use the message box to add any message you wish, such as details about your item, or any message to the buyer about items you have for sale. Thanks for the opportunity to do business.